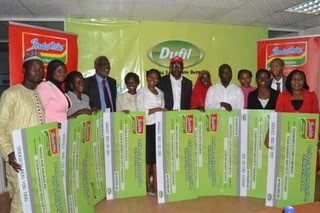 L-R: Group Head, Public Relations and Events Manager, Dufil Prima Foods Plc. 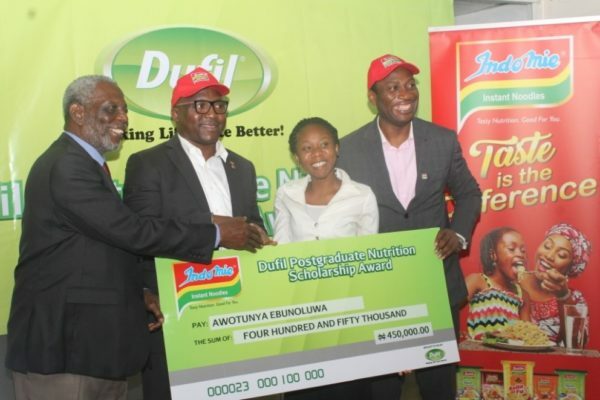 Temitope Ashiwaju; Dufil Postgraduate Scholarship Award Coordinator, Prof. Babatunde Oguntona; Brand Manager, Dufil Prima Foods Plc. Onome Asagbra. Education remains a pivotal point of investment for every society that seeks transformation in its workforce and socio-economic strength. 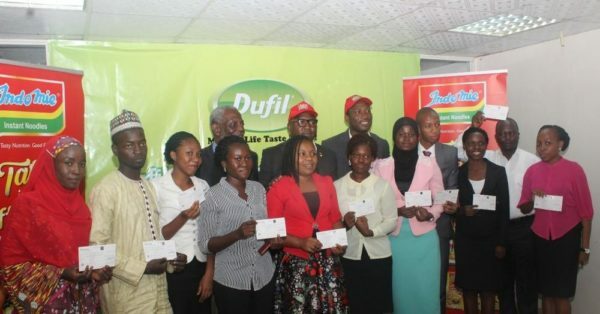 To further strengthen the Nations’ manpower in the food sector by training high level nutrition scholars, Dufil Prima Foods Plc., makers of Nigeria’s tasty noodles brand, Indomie has awarded 12 Postgraduate students drawn from various institutions in the country with N5.4m educational scholarships. 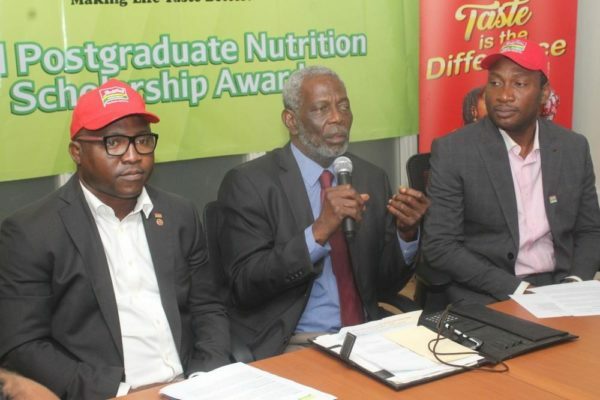 The gesture forms part of the company’s contribution towards strengthening Nutrition education and research in Nigeria, thus consolidating government efforts towards a better education sector. 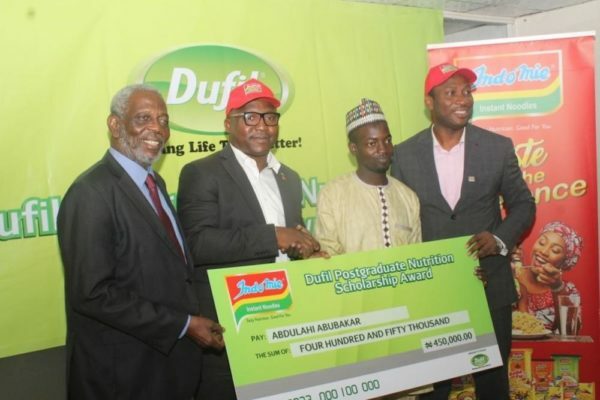 The 12 lucky students who are currently undergoing their M.sc programme in Nutrition and related studies for 2017/2018 academic session received a cheque of N450, 000.00 (Four Hundred and Fifty Thousand Naira) each to cover tuition fees, research grant and stipend for the duration of their Master’s Degree. 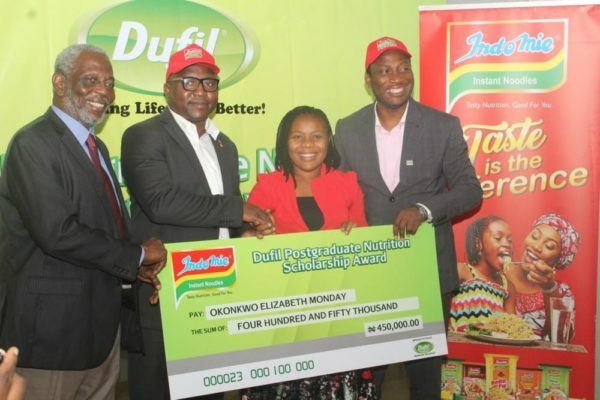 The 12 recipients who were drawn from a pool of numerous entries across the six geo-political zones of the country are: Abdulahi Abubakar (Kano), Adedipe Elisabeth (Ondo), Awosanya Mubarakat (Ogun), Awotunya Ebunoluwa (Ekiti), Babatunde Odunayo Esther (Oyo), Iheme Gideon Onyedikach (Abia) and Iyekekpolor Christiana Imuetinyan (Edo). Others are: Joseph Aaron Nenrot (Plateau), Njoku Onyekachi Jennifer (Imo), Okonkwo Elizabeth Monday (Akwa Ibom), Otunla Adetola Titilayo (Osun) and Yahuza Asiya Salman (Kaduna). 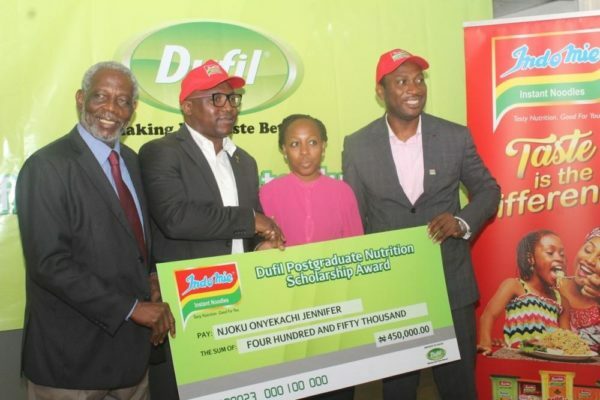 Speaking during the cheque presentation to the awardees at the company’s corporate headquarters in Lagos, the Group Public Relations and Events Manager, Dufil Prima Foods Plc, Mr. Tope Ashiwaju revealed that the initiative started in 2009 and ever since then, the company has not looked back, as the first and only corporate organization sponsoring post-graduate nutrition education in Nigeria. 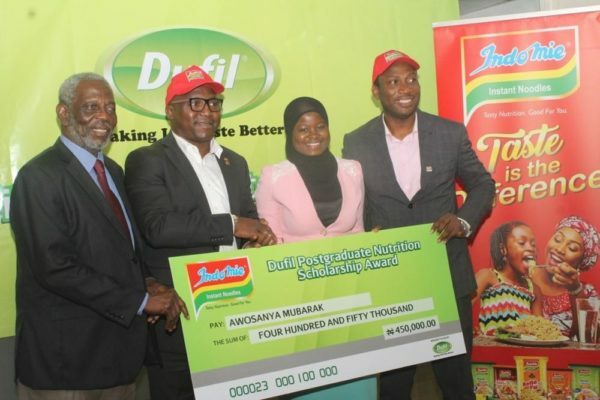 Ashiwaju reemphasized that the company is a socially responsible brand that is committed to the development of manpower in the field of nutrition and dietetics in which the brand is a major player. 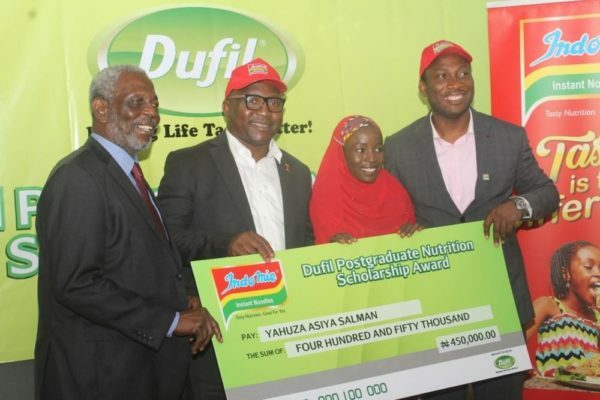 According to him, “Aside from the company’s desire to build manpower and impact positively in the health sector, owing to the fact that a lot of sicknesses and diseases are caused by malnutrition and intake of the wrong diet, Dufil Prima Foods is positioned as one of the health-friendly food companies in Nigeria, and in order to maintain this, the organization would need the services of well-trained nutritionists and dieticians, which we hope this initiative will go a long way in achieving. He added that, considering the success of the programme in the last nine years of it commencement, the Company is determined to provide necessary support for the continuation of the programme in 2017/2018 academic session. 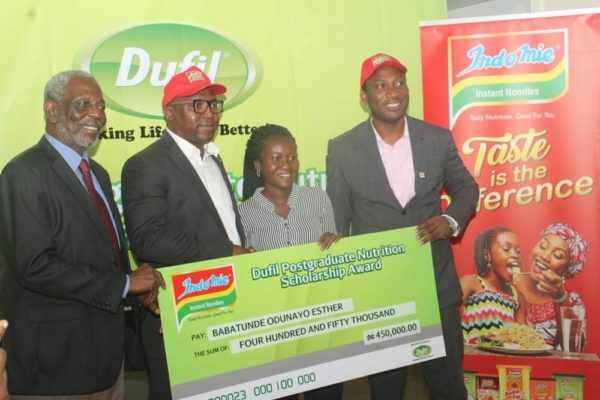 He further applauded the coordinator of the scholarship scheme, Professor Babatunde Oguntona for his transparency in handling the operations of the scholarship since inception. 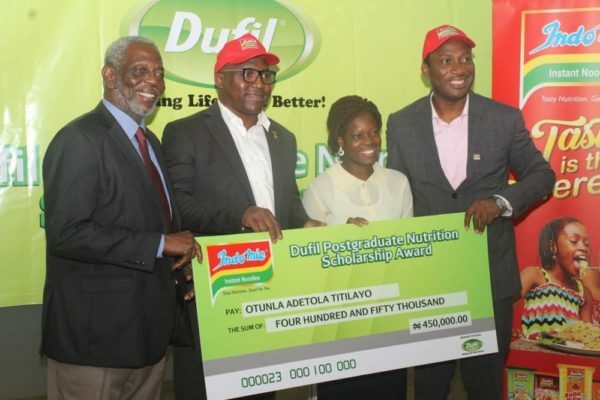 The Coordinator of the Dufil Postgraduate Nutrition Scholarship Award, Prof. Tunde Oguntona, of the Department of Nutrition and Dietetics, Federal University of Agriculture, Abeokuta, commended the company for the positive response to the scholarship, and for sustaining the scheme over the years. 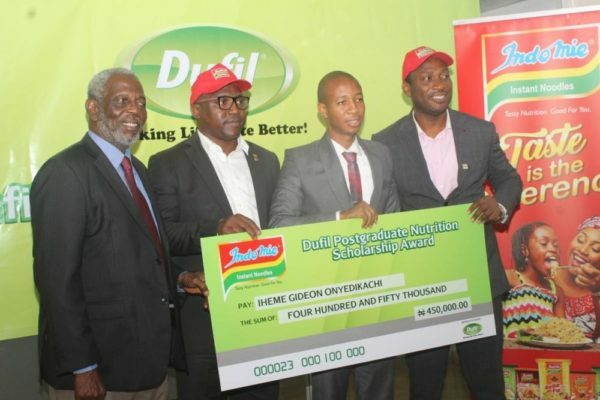 With this he said, the scholarship scheme has recorded huge success and growth since its inception. 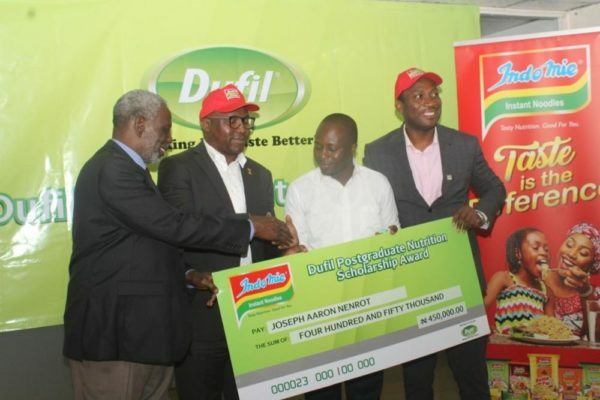 Also speaking at the cheque presentation, the Brand Manager, Dufil Prima Foods Plc, Mr. Onome Asagbra said that Dufil Prima Foods, beyond producing variety of premium products also promotes this kind of initiative and this is also a side of the brand that the company wants the world to see. 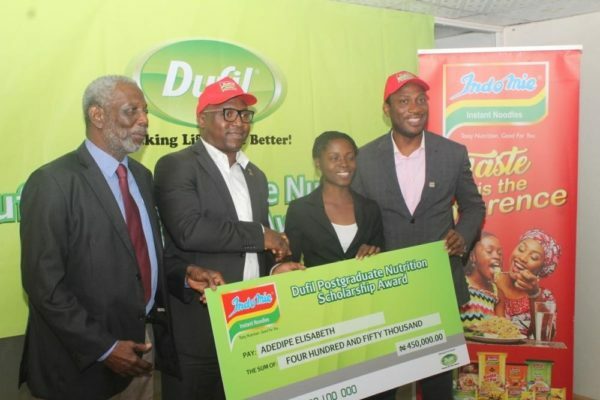 In his words, “The scholarship scheme is a noble course the brand is pleased to be associated with, as it serves as a means of giving back to the society, in order to produce highly trained nutritionists that would drive development in the food sector.” He further encouraged the awardees to be more committed to their studies.